Every once in a while ( read every week), we love to take a detour from our usual dinner fare, which is South Indian food. Sometimes we go to China, Italy, Thailand, to the Mediterranean or to Mexico for food inspiration, of course 🙂 Last week, I found some green chile tortillas calling my name at the grocery store. So, Mexican it was! 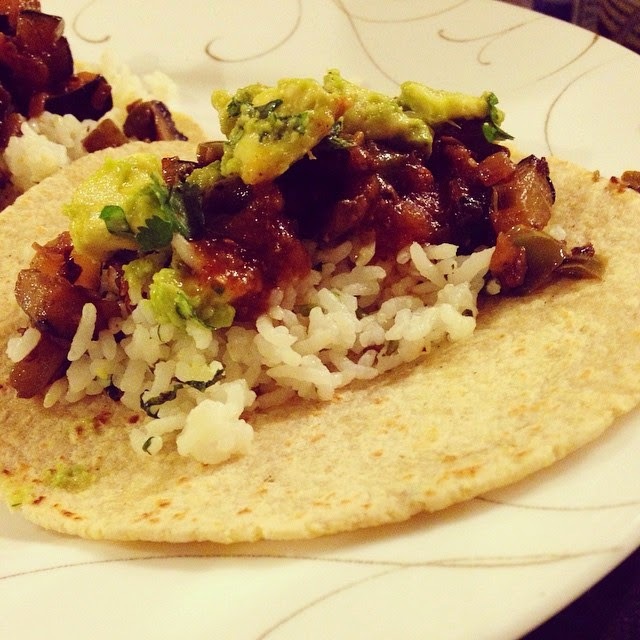 Roasted vegetable tacos – well, technically burritos since they had rice in them, but I’ll just call them tacos. First rinse the rice in water and drain. And repeat. This will remove a little starch from the rice and prevent it from being sticky. Melt the butter in a saucepan and add the chopped garlic, if using. Next, add the rinsed rice. Saute the rice till it is well coated with the butter. Add water/stock, salt and sugar. Cover and cook on a medium flame till the rice is cooked. Let it rest, covered for about five minutes. Add the lime juice and cilantro while fluffing the rice with a fork. For the roasted veggies, I brought out one of my favourite kitchen tools. My cast iron skillet. More on how to clean a cast iron skillet later. So I chopped up some red onions, bell peppers, mushrooms and zucchini. Heat oil in a skillet. Once it shimmers, add minced garlic and some red pepper flakes. First add the onions and saute till they’re translucent. Add the bell peppers and zucchini and some salt. Finally add the mushrooms and saute till add the vegetables are cooked through. I topped this with some avocado chunks. Just avocado cubes with some lime juice, salt, cumin powder and cilantro. Plain and simple. To assemble, I spread some store-bought tomatillo-chipotle salsa on my tortilla. Spoon some of the cilantro-lime rice. Top with roasted veggies and avocado chunks and tuck in! We had some rice, veggies, and avocado left over, so I made S a neat burrito bowl for his lunch the next day!